Walk through the gates and climb thesteps that lead up to the church. Look around at the surrounding countryside and notice how the Church has been built on a small hill. This gives a tremendously open view. Sometimes this spot is lashed by the wind and rain, but at other times it is bathed in glorious sunshine. “sun worship” and carried out their rituals on high ground such as this. These places of worship were sometimes taken over by the first Christian worshippers who built the early churches on the same ground. The Roman Empire provides one of the best starting points for any historical study. The Romans’ most secure Scottish fortification was Antonine’s Wall linking the Forth and the Clyde. Occasionally the Romans did make sorties further north; it is recorded that Agricola’s forces entered Fife in 83 A.D. It is likely that the Battle of Orrea took place very close to the boundary of Auchtertool’s Parish, in the area of Ballingry. There is a hill to the East of Auchtertool Kirk, known as Castle Hill which was possibly the site of a Roman Camp. 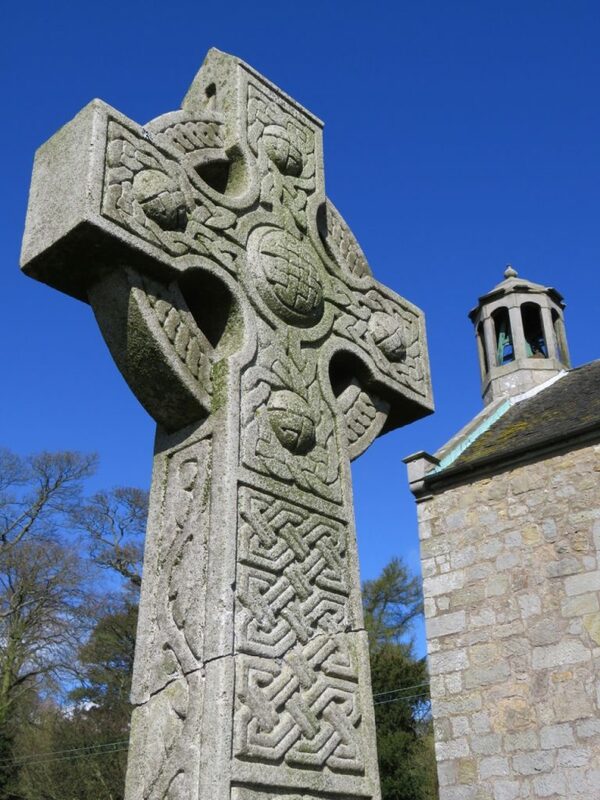 Scotland’s early Christianity developed as part of our Celtic culture. There is a tradition that part of the Kirk’s east gable dates from this era, although naturally such claims are almost impossible to prove. 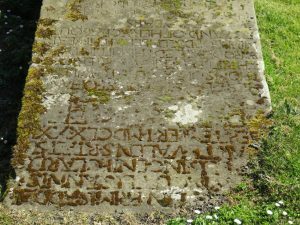 Throughout the country there are very few memorials left to the Celtic Christians; their churches and monuments were much less lasting than those of the later Roman (Catholic) Church. In Celtic times. Fife was divided into two districts, covering the east and the west. The area of Auchtertool’s Parish was within the Western district which was known as Fothrif or Fothrick. Points of Interest: As you look to the South East from this viewpoint, it is possible to catch a glimpse of Balmuto Castle. 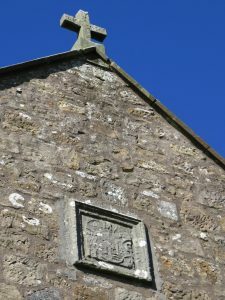 High up on the East gable of the church there is a plaque containing the arms of one of the former lairds, William Forbes of Craigievar. When the Roman (Catholic) Church was established in Scotland, the district of Fothrick came under the supervision of the Abbots of Dunkeld. Malcolm Canmore’s son Ethelred was made both Earl of Fife and Abbot of Dunkeld; thus he became absolute lord of the district and the royal house kept control of the church’s lands. In 1127 the bishopric of Dunkeld was created. King David I gifted the lands of Auchtertool to the new bishop; from that point onwards the lands of the parish were the property of successive Bishops of Dunkeld. It is not known whether a church at Auchtertool was included in the gift to the Bishop of Dunkeld. 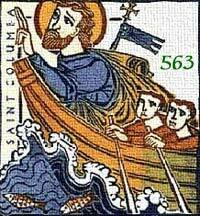 However, it is recorded that in 1178 Pope Alexander III gifted the church of Ochtertule to Walter, Prier of lnchcolm. The Priory of Inchcolm (which was raised in status to that of an Abbey in 1235) lies in the River Forth on the island of Inchcolm and was originally the home for a group of Augustinian Canons. From 1178 to the time of the Reformation, the Prior (later Abbot) of Inchcolm was responsible for presenting priests to minister at Auchtertool Church. It is most likely that Canons from the Abbey fulfilled that role; they certainly ministered at the nearby church in Aberdour which was also the Abbey’s responsibility, The gifting of the church to Inchcolm provides us with the earliest recorded dating of a kirk at Auchtertool. Since then the actual church building has been substantially remodeled and altered both inside and out. However, stones from the ancient churches are almost certainly contained within its walls. At the turn of the century carved stones, possibly from Norman times, were discovered in the north wall. There were signs that the church has been altered and rebuilt up to five times. of entrusting its various members and parts to the protection and oversight of particular saints. The Church at Auchtertool was originally under the charge of St Columba; however in 1421 a Papal Bull transferred Auchtertool to the protection of St Peter. The 16th Century was a time of upheaval for the Church in Scotland and the effects of the Reformation in Europe were beginning to be felt. In 1560 the Reformation Parliament met; amongst its members was James Stewart, the Abbot of Inchcolm. This signaled the end of lnchcolm’s status as a functioning Abbey and thus its role in parishes such as Auchtertool came to an end. The exhibits at Auchtertool Kirk- date from after the time of the Reformation and the history of this period is very well catalogued. Although we do not know the names of any of Auchtertool’s serving Canons and Priests from Roman (Catholic) times, the names of all subsequent ministers are recorded. The oldest surviving monument in the churchyard dates to 1604. Although the Scottish Kirk had now broken its ties with the Roman Church (and papal authority), an Episcopal system of bishops was still in place. Technically Auchtertool Church remained under the authority of the Bishop of Dunkeld, but in reality a great deal of influence lay with the local lairds. The Act of Supremacy in 1690 marked the end of a one hundred and thirty year struggle between supporters of Episcopacy and those who instead advocated Presbyterian church government. It is recorded that the people of Auchtertool were in fact quite happy with prelacy (bishops). 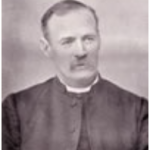 The sitting minister of Auchtertool Church was deposed for refusing to acknowledge the authority of the Presbytery of Kirkcaldy. 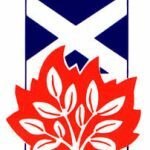 The advent of Presbyterianism put in place the system of church government which still operates in today’s national Kirk. In the Church of Scotland decisions are made collectively by courts instead of by individuals. Auchtertool Kirk has its own Kirk Session and is also represented on the Presbytery of Kirkcaldy and the General Assembly. All throughout Scotland a second struggle was taking place within the post Reformation Kirk. There was ongoing uncertainty about the rights which should be enjoyed by local lairds. At times these patrons of the Kirk were allowed to choose the ministers for the parish. It was also the patron’s duty to maintain the Kirk and manse. In the 18th and 19th Centuries the rights of the lairds began to be questioned. Worshippers who broke away from the national Kirk set up many free kirks. This culminated in the disruption of 1843, which enabled a widespread protest against the practice of patronage. The Free Kirkers had to build their own churches and many were erected in towns such as Kirkcaldy. Although Auchtertool Kirk remained part of the established Church of Scotland, that does not mean that there were no dissenters in this Parish. The statistical account of 1836 reports that there were 92 families attending the Established Kirk and 23 families connected with the dissenters. The rights of a patron were not the only issues at stake: Auchtertool Kirk has a chequered history, depending upon the willingness of the patrons to fulfill their responsibilities. Some of the lairds treated the kirk very well, but others allowed the kirk and manse to fall into disrepair. The Disruption ended in 1929 with the reunion of the National Church of Scotland. The “Free Kirk” cause very much won the day and the rights of patronage had finally been abolished. Ever since that time the members of Auchtertool Kirk have been able to play a part in choosing their own minister. Since 1969 Auchtertool Kirk has been linked to a town church, sharing its minister with another congregation. The initial link with Burntisland was severed in 1986 and the Kirk was instead joined to Invertiel Church in Kirkcaldy. Since 1991 Auchtertool has been linked with Linktown Church, following the union of Invertiel Church and Bethelfield Church. It was before the Reformation that the lands of Auchtertool moved to secular control. In 1539 Bishop Brown granted the lands in feud to Sir James Kirkcaldy, who quickly took up residence at Halyards Palace. Under King James V, Kirkcaldy served as Lord High Treasurer of Scotland. He won favour with the King through his marriage to Janet Melville, the daughter of Sir James Melville of Raith Sir James’s privileged position earned him enemies in the party of Cardinal Beaton. Sir James supported church reform and favoured friendship with England rather than an alliance with France. However, Beaton persuaded the King otherwise and the resulting war with England led to a defeat at Solway Moss. The dispirited King visited Halyards; Sir James and his son William accompanied the King to Falkland Palace where he died shortly afterwards. The death of James V left Beaton the virtual ruler of Scotland. However, Sir James Kirkcaldy and his allies plotted against him and the Cardinal was murdered at St Andrews. Sir James was not actually present at the murder, but his son William played an active part. This deed did not go unpunished and the conspirators were captured; Sir James, William and others were exiled to France. However in 1550 James’s lands were restored to him and he died peacefully at Halyards in 1556. On being released from his captivity in France, James’s son Sir William Kirkcaldy served as an English agent within the French court. Whilst fighting with the French against the German Emperor, he earned himself the title “bravest soldier of his age”. Returning to Halyards in 1557, William gave his support to the Reformation cause. When a force of 1000 French soldiers landed at Leith, William directed the Protestant stand against them. Sir William took a courageous stand by criticising the marriage of Queen Mary to Charles Darnley. Denounced as a rebel he fled to England; on being restored to favour he returned to Halyards. Eventually William led the troops of the Congregation against the Royal Army at Carberry Hill, where Mary and her forces surrendered to him. Kirkcaldy promised Mary safe conduct, but was later accused of failing to carry this through. This was in fact the fault of others, whose dishonesty prompted Kirkcaldy to change sides. Thus Kirkcaldy proved his character as a man who was chivalrous as well as brave. It was while he was Governor of the Castle of Edinburgh that Sir William claimed the fortress in the name of Queen Mary. The English Queen was offended and sent her forces to quell the rebellion. Sir William Kirkcaldy was defeated; he was hanged on the 3rd August 1573. Sir John Boswell of Balmuto succeeded the Kirkcaldys as proprietors of Auchtertool. Sir John and his brother Sir George of Balgonie both shared a competitive nature, neither was afraid of conflict and they engaged in frequent local skirmishes. In 1620 Sir John assaulted James Boswell (a humbler member of the clan) for failing to do him reverence. On a light hearted note; in his old age Sir John was admonished by Presbytery for allowing football to be played at Balmuto on a Sunday. Even today Balmuto Castle remains the seat of the Boswell family. However, their patronage of Auchtertool Kirk was short-lived, passing elsewhere in 1617. The lands and barony of Auchtertool were sold to William Forbes of Craigievar and Magne in 1617. His patronage lasted only 10 years, but it would seem that this gentleman was particularly generous to the Kirk. 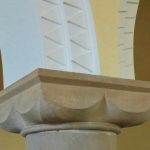 The presence of a coat of arms (representing both himself and his wife) built into the walls of the church in two places suggests that he rebuilt, improved, or substantially repaired the building. The charter which passed the patronage of Auchtertool to William Forbes also granted the inhabitants of the parish the right of free trade. A market cross was erected in the village and provision made for a weekly market and yearly fairs. 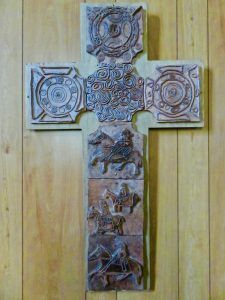 Unfortunately the cross was destroyed in the mid 19th Century. 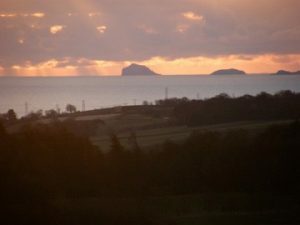 In 1627 the lands of Auchtertool passed to John Skene, after the marriage of Barbara Forbes (daughter of William Forbes) and Andrew Skene; it began the period when the Skene family were lairds of Auchtertool. Andrew Skene soon took up residence at Halyards, became an elder at the Kirk and represented it at the Presbytery. Initially he was a supporter of Episcopacy, but later advocated Presbyterianism. Andrew Skene became one of the Covenanters and as part of the Committee of War for Fife he accompanied the army into England. Strangely enough this led to the reward of a knighthood when King Charles I later attempted to placate his rebellious Scottish subjects. Unfortunately Sir Andrew clashed with Mr. Bell, minister of Auchtertool and there is evidence that he was not “over generous” towards the Kirk. Nevertheless, when he died in 1653 it was here that he was interred. Andrew was succeeded by his son John who became wealthy by practising as an advocate. In 1670 he bought the estate of Grange from William Kirkcaldy and rebuilt the dwelling house there. However, presbytery records show that he too lacked generosity towards the Kirk and indeed allowed the manse to become nearly derelict. Dying in 1707, he was succeeded by his son who was also named John. During his father’s lifetime John lived at the court of the exiled King at St Germains in France. His carelessness with money was such that when he returned his father is reputed to have exclaimed: “Sena a fule to France and he’ll come back ane Ye ha’e spent a’ your siller, and I ha’e nae mair to gi’e ye.” As Auchtertool’s new laird, John was responsible for stripping the area of its forests, a scar which has been left to the present day. In 1713 John was succeeded by his own son (again also named John). The burden of debt was now so great that he resigned the lands to the Earl of Moray in 1715. The Earls of Moray were not resident landlords of Auchtertool, but instead managed the estates from a distance. Family members occupied Halyards in 1730, but by 1793 they had apparently departed; at that time the palace was reported to be a ruin. 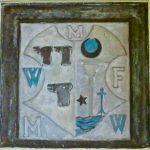 This symbolised the end of the resident proprietors in the parish and also the end of Halyards Palace itself Over the years the events surrounding the palace had shaped a great deal of the area’s history. The Palace of Halyards is reputed to have once been a hunting seat of Malcolm Canmore. With the establishment of the Roman Church, Halyards became the local residence of the Bishops of Dunkeld; it remained so until the first lay proprietor took possession in 1539. The influence that Halyards had on the parish of Auchtertool cannot be overstated. In the days of Sir James Kirkcaldy the palace witnessed dramatic events; it was visited by James V just before his death and the murder of Cardinal Beaton was very likely discussed within the palace’s walls. In later years Halyards was home to other lairds, such as William Forbes of Craigievar and the members of the Skene family. When the Earls of Moray became lairds the palace’s name was changed to “Camilla”, perhaps in honour of the countess who bore that name. This was the beginning of a name which is well known in Auchtertool today; the only unfortunate side effect is that the original name “Halyards” is not so well known. With the Earls of Moray living at a distance, the Palace of Halyards eventually fell into disuse. In 1819 the palace was revisited by a member of the Skene family, who found it in a dilapidated state. Unfortunately the great house was largely demolished in 1847, something which would never be allowed to happen today. The remains can still he found on neighbouring farmland about a mile from the Kirk. The existing side-aisle at Auchtertool was built a century ago by the man who investigated so much of Auchtertool’s history. This was intended to replace an earlier aisle (of different design) which had fallen into ruins. Although he had no training in Architecture or building, Rev. William Stevenson nevertheless designed and supervised the construction. The north wall of the church was replaced by the present arches and columns. It was while this work was taking place that ancient carved stones were discovered, which perhaps date parts of the building back to Norman times. It is not known whether Stevenson incorporated these stones back into the new walls o: whether they were instead removed elsewhere. Within Stevenson’s Aisle, there is a carved stone containing a coat of arms. This represents the families of both Mr. William Forbes (laird from 1617 to 1627) and his wife. The left hand side represents the Forbes lineage and consists of three animal heads. The right hand side of the shield represents the Udward (his wife’s) family. Notice the interesting symbols which it contains a star, crescent, wavy base, and the heads of three bears. A similar coat of arms is incorporated in the East gable outside the building. When a member of the Skene family visited the church and parish of Auchtertool in 1819, he was shown this crypt and informed that it was where his ancestors were buried. Reputedly the tomb had once been uncovered and about a dozen coffins were revealed inside. At that time the old side aisle had fallen into ruins and the chamber was accessed from outside the church building. Skene reported that the arms of Forbes of Craigievar were built into the wall very close to the crypt; he suggested that this was also the tomb of the Forbes family. This might date the crypt to the beginning of the 1600’s, making it an early example of post reformation architecture. When William Stevenson carried out his works on this part of the church, the crypt’s entrance was brought within the walls of the sanctuary. The arms of William Forbes are still near the crypt, but they must have been moved (at the time of the new aisle’s construction) from the North wall, to the wall connecting the aisle and the organ loft. The diagram shows a plan of the crypt with approximate dimensions. Built of stone it is arched across its 3.5m width and runs like a tunnel along its 6m length. At the centre of the arch (its maximum height), the crypt is just over 2.0m high. Stevenson reported that the original side aisle was built over the crypt. This may mean that it was of the same shape and dimensions, effectively running at right angles to the main aisle. It is possible that this was a small side-chapel which was used by the lairds. The coffins, which were in the crypt at the time of burial, have now totally disintegrated. There are a few fragments of wood remaining and the original metal coffin handles lie in the dust. The human remains have fared only slightly better, there being about half a dozen identifiable skulls alongside skeletal remains. The other remains have been absorbed into the ground, the only testimony to their presence being discoloured patches of soil. There is an interesting story about one of the funerals which took place at this spot. After the reformation, a burial was secretly carried out according to the Roman (Catholic) rite. Such an Occurrence would have incurred the wrath of Protestant leaders and the event therefore took place at the dead of night. Reputedly the voting Walter Scott (later to become the famous author) was one of the mourners present at the funeral. It is said that this funeral procession can still be spotted on an evening in August. A coffin can be seen being borne down “lady’s walk” from Halyards Palace. Address to Mr. David Millar: This framed presentation certificate was given to the schoolmaster (also Session Clerk) in 1901. The occasion commemorated 50 years of service and one of the signatories is Rev William Stevenson. The occasion of Mr. Millar’s jubilee is in fact recorded in Stevenson’s book. This was recovered quite recently from its position decorating the wall of a pub in England! Diary of Rev. Patrick Grant: This hand-written book contains the reflections of a local Parish minister in the 1860’s. Patrick Grant was a regular visitor to Auchtertool and was himself the minister of Auchterderran. In his book Kirk and Parish of Auchtertool, Stevenson (pictured left) tells of Patrick Grant dining with Thomas Carlyle at the Auchtertool manse, home of the then minister Rev. Walter Welsh. The famous writer was somewhat dismissive of Grant and as a result there was nearly a stand up fight. Unfortunately this diary is dated after that encounter; it would be very interesting to know what Patrick Grant really thought of Carlyle. The diary was discovered by the compiler’s father, and was recovered from a manse in Morayshire. 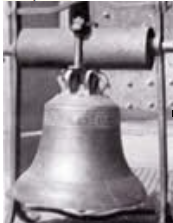 The Old Church Bell: At the front of the church you can see the old bell, which was removed from the tower when the present one was installed in 1887. This was hidden away behind the organ for many years but is now on permanent display. 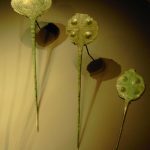 Two of these items were retrieved quite by chance and there is a strong possibility that there are many other such relics waiting to be found. Can you lay your hands on them? Do the people of Auchtertool have anything of interest hidden in their lofts? It might be beneficial to catalogue such items, or to display them for everybody to see. What to look out for: More diaries; Communion Tokens (like coins, handed out before the days of communion cards); bibles and hymn books, certificates, drawings, photographs etc. Please contact the minister if you can help. Built by Casson and Miller of Perth in 1886, the organ was gifted to Auchtertool Kirk by Rev. William Stevenson. This was a very generous donation and it has been said that the cost must have equalled his stipend for a whole year! Very often we make the mistake of thinking that organs are a very traditional part of church worship; in fact they are quite a modern innovation. For seven hundred years this church had no organ; before Stevenson’s ministry singing was accompanied by a harmonium; prior to Rev. Andrew Miller’s ministry (1880—1885) singing was unaccompanied and conducted by a presenter. 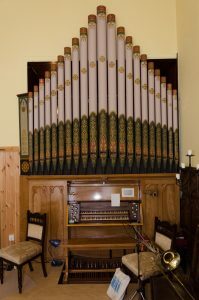 This organ is one of only six of its kind; it is similar to the one that was in Stevenson’s previous church St John’s in Perth. are normally locked in a safe place, but are in use on Communion Sundays. Two cups bear the date 1763; the underside of each is inscribed “Mr. Moir, Minr”. The dating and the inscription suggest that they were gifted to the church by Rev. Henry Moir, who was minister of the parish from 1746 to 1786. By comparison the wine jug is much more modern (a presentation in 1904), but at the time of writing even that is now over 90 years old. It is very hard to “value” items such as these. The true value for the people of Auchtertool is surely different from material: These cups have been used for 230 years and the sacrament has been celebrated with them by 17 ministers of the parish. People drink from the same cups as their parents, grandparents, great grandparents, great great grandparents—and you can add a few more greats to that. It reminds us that the tradition of the sacrament goes back far further than even this Kirk—right back to the time of Christ. It is only in recent times that it has become customary for infants to be brought to church in order to be baptised. Before that most people were baptised either at the manse or in their own homes: before the advent of central heating the church could be a cold and miserable place, not at all suitable for children. Notice the interesting carvings on the font. This is another item which dates from Stevenson’s own ministry. The baptismal register (which is still in use) goes right back to 1882 and it contains details of many families within the parish. It is often assumed that churches have always had stained glass windows. However, Auchtertool Kirk reveals that many of such items actually date from the Victorian era. The Victorians left behind numerous memorials of varying types; most of the windows in this Church are memorials for family members and friends. Look at the different windows and read the inscriptions carefully. There is a hidden secret in Auchtertool Kirk and if you look very closely at the south wall you may be able to detect what it is. At one, time there were pictures and inscriptions painted on the walls (see photographs below); unfortunately they have been obscured by re-decorating since the photographs were taken a century ago. 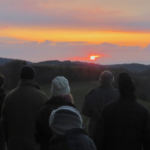 Walk around the churchyard and view some of the stones and memorials which are there. The oldest stone marks the grave of James Burnlie who died in 1604. Although it is quite worn, you will notice the last traces of hi crest on the stone, as well as one representing his wife. There is also a stone marking the grave of one of the first minister: Rev. David Martin. It shows the recumbent figure of the minister dressed in his gown and bands. In the far corner, near to the side gate of the former manse, you will find the grave of Rev. Walter Welsh, who was so familiar with Thomas Carlyle. The manse itself has been a private house ever since Auchtertool began to share its minister with another church. It is easy to imagine that the famous author once sat in the grounds, appreciating the world of nature around him. Looking at the manse and the church, you might well assume that Auchtertool’s ministers used to enjoy a quiet life—however, there were always incidents which kept them on their toes. Auchtertool found itself unwittingly caught up in the events of first Jacobite Rebellion While the rebel Earl of Mar was in Perth; he received news that a loyalist vessel (carrying arms) had anchored at Burntisland. Mar made a successful bid to capture the vessel and advanced 500 highland troops into Auchtertool to be held in reserve. These soldiers turned out to be somewhat undisciplined. They ran amok, plundering the village. It is reported that the manse was one of the houses which received their attention. Rev. Andrew Elliot was the unfortunate minister who experienced this. Another sign of local excitement is the Janker stone which lies in the graveyard; stones like these were placed over coffins inside the graves in an attempt to foil grave robbers. Auchtertool’s churchyard has always been a secluded place and in the past the minister was very often out of the manse; this meant that the churchyard was a perfect spot for the crimes of the “resurrectionists” to take place. Sometimes the activities of the grave robbers were discovered; a local association was set up, which used iron coffins and janker stones to protect newly buried bodies. For a spell there were even armed guards watching the churchyard. 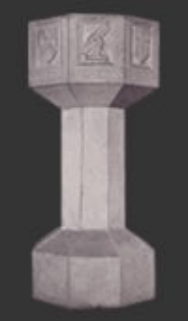 The Janker stone itself was pinned in place with a series of iron bars. Also take a look at the belfry; this contains the new bell which in fact dates back to 1887. It was gifted by the minister Rev. Donald Macmillan and bears an inscription. 1574 William Thalland – A “reader” appointed before there were enough Reformed ministers. 1700 Andrew Elliot – Presbytery Clerk; had not served communion after three years because of sinfulness of the parish! 1891 William Stevenson – The man, by whose efforts the history of Auchtertool was so carefully catalogued. 1908 J.S.W. Irvine – Acquired a doctorate while ministering here. 1969 Joseph Easton – Well qualified academic; also minister of Burntisland. 1977 Donald Mackenzie – Also minister of Burntisland; then assisted at Kirkcaldy: Pathhead. 1986 John Cowie – Also minister of Kirkcaldy: Invertiel; then in Amsterdam. 1991 George Cowie – Also minister of Kirkcaldy: Linktown; then at Holburn Central Aberdeen, now Glasgow Presbytery Clerk. 2000 Catriona Morrison – Also minister of Kirkcaldy: Linktown. 2 Baptismal Register of Auchtertool Parish, 1882—1996. 3Rev. Patrick Grant, personal diary, 1860’s.